Great location close to the airport. We had evening flight to Agadir. If you want to start road trip this is a great motel to sleep. Room clean but cold as it is December. Hot shower. Warm blankets. Man at the reception gave us his water because all shops were already closed at 1am. Great service after a long journey! The staff was very friendly and kind. Helped with any questions we had. Standard hostel with comfort bed and good working heating. Pretty good breakfast. Safety parking place. This is a family run hotel. It's basic but clean. The staff bent over backwards to make sure we were fed, having arrived late and the onside kitchen was closing. Very friendly, for a cheap nights accommodation, it does everything you need it to. This hotel is located not far from Agadir Airport, what makes it good choice for a one night stay for those who arrive late. The standard is not very high, but acceptable and adequate to the price. I was surprised cause reviews were not really good. Instead the place is lovely, basic rooms but spacious, clean, not in a really cool area but very close to airport and lovely house with orange trees in front! The staff is so lovely, the girl at the reception took care of me and always smiling and helpful! We needed a place, close to the airport with a free parking. It was a perfect match. De mogelijkheid om hier snel weg te wezen beviel ons nog het meeste. We waren ook de enige gasten in dit “hotel”. Hotel Ribis This rating is a reflection of how the property compares to the industry standard when it comes to price, facilities and services available. It's based on a self-evaluation by the property. Use this rating to help choose your stay! 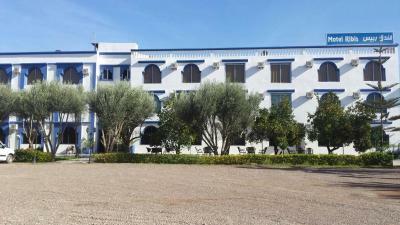 This hotel is 9 miles from the beach of Agadir and offers air-conditioned rooms and an outdoor pool. Guests are free to take in the views of the grounds and the mountains from the poolside terrace. Free Wi-Fi is provided and all rooms offer views of the pool, the garden or the mountains. Each room at Hotel Ribis comes with satellite TV and a private bathroom with a shower and a hairdryer. Traditional Moroccan cuisine and Berber specialties are proposed in the hotel’s on-site restaurant, and breakfast is served daily. Meals can be enjoyed in the dining room or al fresco on the terrace. Free parking is available and the Agadir Al Massira Airport is 10 miles away. The hotel is 4 miles from the city of Inezgane and a 20 minute drive from the Souss-Massa National Park. This property also has one of the top-rated locations in Ait Melloul! Guests are happier about it compared to other properties in the area. This property is also rated for the best value in Ait Melloul! Guests are getting more for their money when compared to other properties in this city. When would you like to stay at Hotel Ribis? This air-conditioned room includes satellite TV and offers views of the grounds, the mountains or the swimming pool. House Rules Hotel Ribis takes special requests – add in the next step! Overall dreadful hotel. They had a restaurant but only did breakfast and breakfast consisted of one crossiant and pot of tea. What’s there to say. I liked nothing about this hotel. Arriving in the early hours of morning, gate was closed and property appeared as if possibly closed down. Taxi driver was persistent in knocking on gate to gain entry. If we had arrived by self drive we might have gone away. Old and used furniture. Unfortunately not really clean. Nice place, helpful staff and tasty breakfast. Wrong address in googlemaps!! Breakfast nothing special.